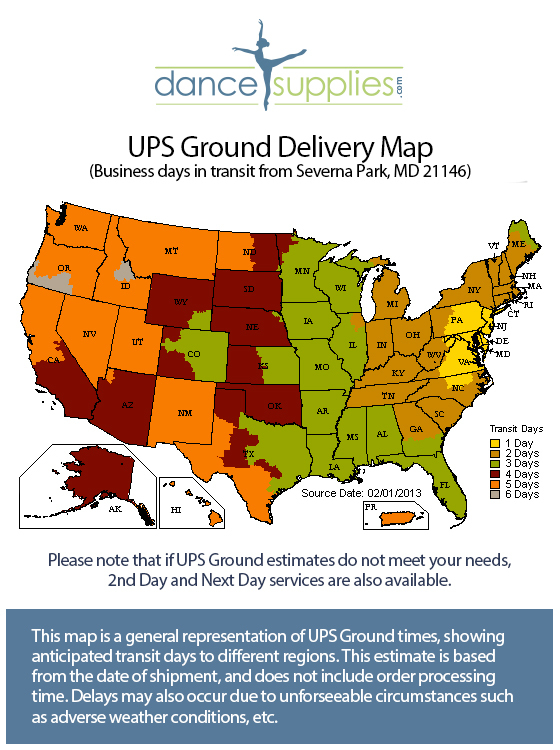 • UPS Ground - arrives in 1-6 business days from date of shipment based on distance to destination. For UPS Ground Time Estimates click here. • UPS 2nd Day Air - arrives in 2 business days from date of shipment. • UPS Next Day Air Saver - arrives next business day from date of shipment. Please note that UPS does not deliver to P.O. Boxes and does not pick up or deliver on weekends. • USPS First Class Package Service - generally arrives in 2-3 business days from date of shipment based on distance to destination. Available only for lightweight packages. While USPS is generally very reliable, rare delays sometimes do occur and please note this is a non-guaranteed service. • USPS Priority Mail - generally arrives in 2-3 business days from date of shipment based on distance to destination. While USPS is generally very reliable, rare delays sometimes do occur and please note this is a non-guaranteed service. Shipping costs are calculated based on order weight, method of delivery, and destination zip code using shipping rates provided by UPS/USPS. Orders received very late in the day may not be processed until the following morning. Orders received on weekends will be processed on Monday. Orders of $100 or more qualify for free shipping! This promotion is valid for shipments within the U.S. only, and we will use either USPS Priority Mail or UPS Ground service based upon the items ordered. Please note that due to manufacturer's restrictions we are unable to provide free shipping on Glam'r Gear dance bags. We cannot be responsible for delivery delays due to causes beyond our control, including but not limited to: inaccurate or incomplete shipping address entered by customer at checkout, the absence of a person or the refusal of such person to accept the shipment delivery, adverse weather conditions. Refused deliveries may incur additional charges. For all shipping inquiries, or if you have a special shipping request, please contact us at support@dancesupplies.com. We would be delighted to assist you. Please note that our inventory availability changes hourly and not all items offered are always in stock. If you would like to check on the availability of a particular item please email us at support@dancesupplies.com. For customers located outside the U.S. (and U.S. territories), due to manufacturers' agreements we are prohibited from shipping certain brands to you, including Bloch, Capezio, Bunheads, and Mirella. If you try to process an order with items from these manufacturers, you will see an alert announcing that we cannot fulfill it. The alert will specify the restricted item, and once removed from your shopping cart the order can be processed as normal. If you have questions or experience any problems placing an international order please contact us at sales@dancesupplies.com. With international orders we are unable to make partial shipments. If any item in your order is on backorder we will contact you by email. Options will include waiting for the backordered item to arrive, adjusting the order to cancel the backordered item only, or canceling the order altogether. • USPS First Class Mail International - generally arrives to your local mail service in 1-3 weeks from date of shipment. • USPS Priority Mail International - generally arrives to your local mail service in 5-10 business days from date of shipment. • USPS Priority Mail Express International - generally arrives to your local mail service in 3-5 business days from date of shipment. • UPS Worldwide Expedited - generally arrives to you in 3-5 business days from date of shipment. Note that the above delivery estimates are based upon the vast majority of shipments, but due to the complex nature of international mail longer deliveries do sometimes occur. Additional delays may also occur due to the customs handling process in your country. DanceSupplies.com has no control over worldwide customs departments or your local postal service, and shipments may be subject to customs, duties, and Value Added Taxes (VAT) of your country. Unless due to an error on our part, customers are responsible for any shipment fees associated with delivery, a return, exchange, etc. We are not responsible for any lost, stolen, or delayed shipments. Returns may be made within 30 days after the date of shipment. Simply ship the item you wish to return to 556D Gov. Ritchie Highway, Severna Park, MD, 21146. Please include your Order Number, a copy of your order receipt, and a note explaining the reason for your return with the package. We recommend that you ship your return via UPS or insured U.S. Postal Service, and if returning shoes or other fragile items please be sure they are packaged safely in a durable box. Please note that all returned items must include all of the manufacturer’s packaging and must be free of any damage or signs of wear. For sanitary reasons, tights and men's dance belts may not be returned/exchanged. Clearance items are "final sale" and also may not be returned/exchanged. Once we receive your returned item, we will process a refund and notify you by email that the refund has been completed. If you would instead prefer us to send you an exchange item we would be happy to do so, and just include those instructions with your return. You may also arrange for an exchange in advance by emailing us at support@dancesupplies.com, or calling us at 800-90-DANCE. Note that shipping charges for exchanged items will apply. If your original order had qualified for and received any special promotions, such as a free item, volume discount, or free shipping, and by making a return the "final" order would not have qualified for the promotion, the benefit originally awarded will be deducted from the refunded amount. If you have any questions about our policies, please call us at 800-90-DANCE. We will work very hard to assist you however we can!